Deer are very common in the uplands and Wicklow has one of the highest deer populations in the country. Sika Deer which were introduced to the Powerscourt Estate in 1860 escaped and interbred with native Irish Red Deer. Other mammals of note found in the uplands include; Irish hare, feral goat, red fox, badger, pine marten, otter, stoat as well as nine out ten of bat species t be found in Ireland. Irish mammals are protected by the Wildlife Act 1976 -2000 with additional protection in place for rarer species e.g. otter. The Wicklow/Dublin uplands provide an important habitat for a range of bird species. 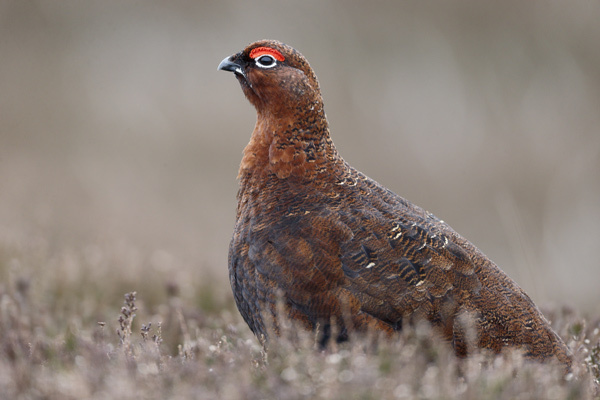 Red Grouse in particular are associated with the heath areas. This threatened species nests in older heather which provides cover from predators. They also like areas with less mature heather to feed. Therefore it is important that there is a range of vegetation type to provide optimal conditions for their breeding success. The Wicklow Mountains National Park is currently managing an area of heath near Djouce to boost the population there. Other birds found in the uplands include; golden plover, snipe, redshank, skylark, meadow pipits, whinchat, ring ouzel, raven, merlin, wheatear, peregrine falcon. If you are satisfied that you have correctly identified any species in the Wicklow/Dublin uplands you can submit your sighting to the National Biodiversity Data Centre.